Items are organized linear (from a number 1 to number x) or in a loop. 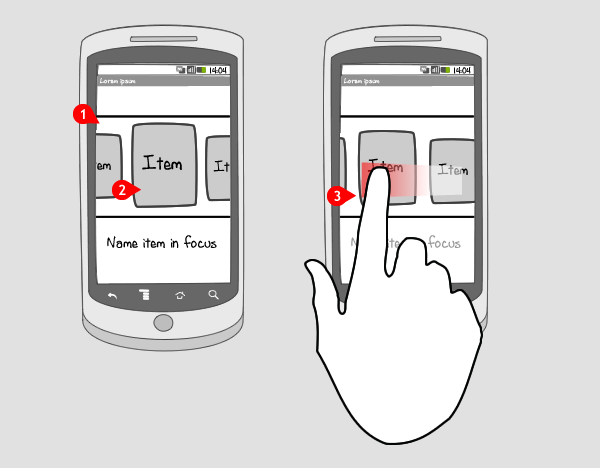 Focus (optional) is brought to the screen by highlighting or increasing the size of the item in focus. A carousel can be used when you want to provide an appealing method for object selection, using pictorial objects. It is also useful when you have limited screen real estate available for many navigation items. Do not use a carousel when it is necessary for the user to see all navigation items at once. When screen estate is really limited, consider using navigation items in the options menu. Carousel navigation comes in different shapes and sizes, depending on the screen real estate that is available and the desired user experience. Two frequently used options are: a full-screen carousel as starting point for your app and a carousel with many menu items often used on top of the screen. 1 In Sportypal, the user can choose a new workout using a continuous carousel, in which all items are viewable. Here one item is clearly in focus. Swiping the carousel, or tapping on the arrows makes the carousel move one step at the time. So the user has a maximum of 2 steps to take to reach the item he wants to. 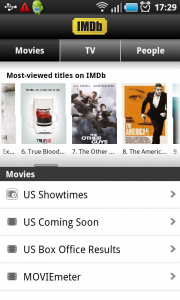 1 A linear carousel at the top of IMDb's homescreen lets the user scroll though the 25 most viewed titles. In this carousel, there is no focus. The amount of items that move through the screen, depends on how fast the user swipes over the screen. Good explanation! But can’t you add some examples, code, urls to examples, anything that can help us to implement that? please share code to implement this. Please Share Code… for carousel..
PLZ, can someone share some example, framework or library the implements a carousel? Thank you for this article on an Android 3D Carousel. I have an Android Image Carousel board on Verious with this post. I’d like to share it with anyone interested in learning carousel implementation and design. Please let me know if there’s anything I can add to make a more comprehensive resource for other developers.